British architect Peter Dickinson’s design is lively, with turquoise and chartreuse spandrel panels throughout the building and a butterfly roof for a simple tool shed. They're just a series of interlocking hoops and a few balls – likely meant to represent electrons and their orbits – held aloft by a swoopy arch over a reflecting pool, but they represent so much more. 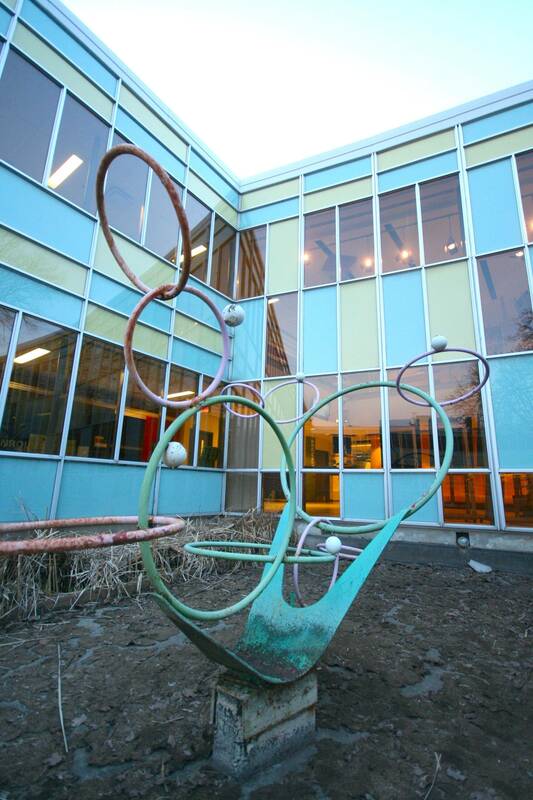 It was "a very optimistic time in North America, nuclear power, the war was over, things were changing for the better," agrees Nate Horowitz, dean and campus principal of Centennial College's Story Arts Centre, where the sculpture has sat since 1954. But it also shows the commitment the college has demonstrated to one of Toronto's almost-forgotten Modernist gems, which they took over in 1978. Built as the Toronto Teacher's College, the design for both sculpture and building was penned by Peter Dickinson, a larger-than-life, British expat who chain-smoked and partied his way into the hearts of the postwar city before his untimely death in 1961. Indeed, his was the only architect's mug featured in Toronto '59, the booklet that commemorated the city's 125th anniversary. Mr. Dickinson, as aficionados know, was one of a handful of unlikely heroes who reset the staid course – or perhaps turned it upside down and vigourously shook it – of Toronto architecture. Raise in London, where he'd worked on a water feature for the Festival of Britain after graduation from the prestigious Architectural Association, Mr. Dickinson arrived in 1950 ready to build the future. As chief designer at Page and Steele, he'd began with the Yolles and Rotenberg Building at 111 Richmond St. W. (designed 1950, opened 1954; recently restored and now home to Google), and Benvenuto Place Apartments for the Yolles family in 1951. By 1952, at the tender age of 26, he'd sketch out the Teacher's College as a long rectangle with a quadrangle for a tight, residential site at 951 Carlaw Ave. He'd place a flying, boisterous concrete canopy over the front door and dress it in a rhythmic curtain wall on both the street-facing and the quad-facing façades. And to really make the composition dance, he'd curve one of the quad's walls inward, randomly place turquoise and chartreuse spandrel panels throughout and give a simple tool shed a butterfly roof. A boisterous, concrete canopy hovers over the entrance. "It was the only award he ever won," Mr. Horowitz says. "The Massey [Medal] for best new educational building in Canada; he never won awards for O'Keefe Centre, now Sony Centre, the Inn on the Park [or] all the buildings he did in Montreal and Ottawa." While not dean at the time, Mr. Horowitz was the one who, "on a hope and a wish," put together a proposal for the creation of an arts centre when Centennial's business school announced they would vacate the building in the late-1980s. And while his plan was ultimately adopted, during the years of planning with architect Alar Kongats (an Estonian-Canadian who is "a true Modernist" according to Mr. Horowitz), the building was used as the set for Degrassi High, the hit CBC teen drama which aired from 1989 to 1991. While Mr. Kongats's interventions are noticeable – notably the removal of a 600-seat auditorium that was, along with the CNE'S Queen Elizabeth Building, considered "practice" for the O'Keefe Centre – they are nonetheless sensitive to Mr. Dickinson's lines. The library is a pop out, the few windows that were added to the brick walls are thin and reserved, and, throughout the interior, touches of Mr. Dickinson remain both large and small. Large: the playful ramp to the second floor or the oceans of terrazzo floors; small: peeks of long Roman brick hiding behind billboards filled with Centennial's word-cloud branding and original handrails in the stairwells. Throughout the interior, touches of Mr. Dickinson remain, both large and small. Top: Word-cloud wall. Bottom: A ramp leads to the second floor. Speaking of which, Mr. Horowitz is so in tune with his building, during a recent walkabout he rushed us past students gathered around the baby grand to show me "original" graffiti etched into those handrails by naughty student-teachers of the 1950s. When he couldn't locate them, he was visibly upset. This prompted me to ask: "Did you know about Dickinson before you started working here?" "When we got the building I started to research him," the affable dean said. "And I found I had a kindred spirit with him, and I really liked what he was doing and it felt right; so one of the dean's awards we give to students is the Peter Dickinson Award for those who are willing to take risks … because I thought, let's honour him, let's honour his memory, because he took risks." Nate Horowitz, dean and campus principal of the Story Arts Centre, stands outside the building. It was probably a risk, I suspect, when Mr. Horowitz asked for money to reproduce that balls-and-hoops sculpture when the original rusted out, but it got done. It was probably a risk when he expanded the Story Arts Centre curriculum to include storytelling via hip hop, dance, animation and gaming rather than sticking with traditional media (radio, television, photography and journalism, which are still offered). The large number of students working late in the many studios and edit suites, or filling the hallways with song on a random Wednesday evening, are proof he was onto something. "Dickinson would've loved this," Mr. Horowitz offers, "because he would've felt right at home in this vibe, this environment." While adaptive-reuse success stories of Modernist buildings aren't completely unheard of, it's rare for their custodians to be so plugged in. Then again, as author Christopher Armstrong points out in Making Toronto Modern, Mr. Dickinson, in his first five years, "made a splash in the Toronto pond and thrust the ideas of Modernism firmly in front of people's noses." Look closely and you'll see ripples in the reflecting pool of the Story Arts Centre.